Feejit has the ability to stretch its arms multiple times their normal length to slash at opponents from a distance. 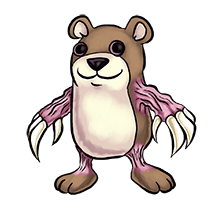 Despite their fleshy countenance, its limbs are protected from drying out by a transparent layer of skin. It is primarily herbivorous, feeding on roots, bulbs and tubers, but it also enjoys honey and bee larvae now and then. Though a ferocious fighter, it is notoriously lazy and spends most of its time asleep in its den. Feral populations of this Kreature exist, but they are very rare.